The Government of Belize and its debt review team, led by Ambassador Mark Espat, have been trying since August to convince creditors who had subscribed to the US$544 million super bond back in 2007 to agree to a significant restructuring that would help put Belize back on the path of debt sustainability. Prime Minister and Minister of Finance Dean Barrow and the debt review team held a press conference at the Best Western Belize Biltmore Plaza Hotel last Friday evening to announce what Barrow described as a “pre-Christmas treat”—a breakthrough in the debt negotiations that began four months ago which could save Belize US$150 million. Amandala readers will recall that the Government of Belize released three indicative restructuring scenarios in early August and creditors finally responded with their counterproposals in November. However, the Government of Belize was not satisfied with the counteroffers, and it responded with new proposals shortly afterwards. The Government’s proposals have generally called for an interest rate lower than the 8.5% applied in August to the super bond under a step-up interest scheme, and Belize additionally proposed significant principal “haircuts” along with an extended repayment period. 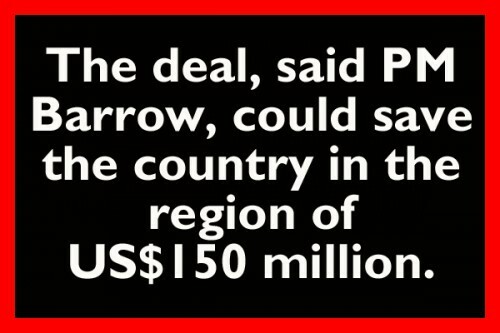 To date, the details of the counteroffer from creditors have not been disclosed, and neither have the details of the agreement Barrow said was reached in principle Friday afternoon, after direct talks he had with Ajata Mediratta, co-president of Greylock Capital Management and co-chair of the creditor committee. He indicated that a term sheet would be prepared next, based on the agreement he has with Mediratta, after consultation with creditors. “Until that term sheet is prepared and the lawyers are going to begin work on that almost immediately—of course, I imagine the Christmas holidays will intervene—but until that term sheet is prepared and signed off on, I am not at liberty to tell you all the details of what we have agreed,” Barrow said. A committee spokesperson has confirmed the announcement by Prime Minister Barrow, saying his comments “are generally accurate.” Amandala has been advised that the Committee may issue a formal statement next week. The direct conversations with Mediratta, said Barrow, were facilitated by the Speaker of the House of Representatives, Michael Peyrefitte. Barrow said that they are aiming to conclude the new bond arrangement in February, before the next payment on the super bond is due around mid-February. Belize’s last payment on the current bond was made in September 2012, after it missed the August 20 payment of US$23 million, making the point that the new interest rate of 8.5% had made the debt way too onerous for the Government of Belize to service. He added that at that point, the debt team will meet again with the social partners to discuss the details. Financial Secretary Joe Waight cautioned that the Government will not have an immediate surplus to spend as a consequence of the bond restructuring.